As the echoes of the Tucson shooting still ring in our ears, one thing is completely and abundantly clear. When it comes to managing America's completely insane approach to firearms, ain't nuthin' gonna happen. It never does. You can slaughter little Amish children. You can kill dozens of high schoolers at Columbine. You can mow down scores of promising young college students at Virginia Tech. You can kill Federal Judges and patriotic little girls born on September 11, 2001. What you'll get is nothing, nothing but the spokesperson for the National Rifle Association, clucking about how now is not the time, and how we should just be praying for the families. You'll get inaction on the Hill, and in state capitols. The echoes of gunfire will fade, until maybe six months from now, when a massacre large enough to catch our jaded eyes happens again. Not that it doesn't always happen, many times a day, as a Vietnam-wars-worth of Americans die every year on the receiving end of a bullet. Gun control, as an expression of managing a murder rate that is the worst in the developed world, just is not going to occur. Our political culture lacks the courage for it, because too many Americans own firearms and don't want to be told that somehow they are bad for doing so. Those sane enough to see this for the problem it is might plead and reason, and point to the painfully obvious statistics, but that hasn't worked. The essence of the debate hasn't changed since I was a middle-schooler, and still the massacres come, and the blam, blam, blam of individual shootings continue. Kill, Equivocate, Forget, Repeat. Thirty-thousand dead American citizens annually means this is 1) a major issue and 2) a national disgrace, but we're just plain stuck. So how to get out of this? Reason isn't enough, evidently. To steal the recent rhetoric of insane ultraconservative Sharron Angle, I think we need a Second Amendment remedy. No, that doesn't mean opening up on NRA headquarters with that M134 you bought for home defense, as satisfyingly ironic as that might be. 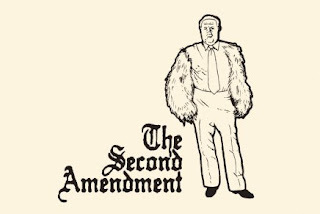 What would seem more constructive is to approach regulation of firearms from an originalist Second Amendment perspective. As Tea Party folks are fond of telling us, the purpose of the Second Amendment is national defense. Period. It does not, in it's plain text reading, exist so that we can get us some venison. It does not exist so that we can menace folks with the threat of a buttload of birdshot if they don't get the [heck] offa our property. It exists so that the citizens of our great Republic can be prepared and ready to defend the Republic from invasion and threats to our constitutional liberties. So far, this is all Red State Red Meat. Well, I'm just getting rolling. If you are an American, you have the right to possess a firearm. But it's more than a right, about which you selfishly whine. It's a duty. It's the duty to use that firearm in defense of this country should the need arise. If you are unwilling to fulfill that duty, inadequately trained to fulfill that duty, or mentally incapable of fulfilling that duty, then you should not be in possession of a firearm. What? You don't love America enough to stand up and defend her in time of crisis? You gonna go there, son? My humble legislative proposal...which will go no further than this blog and the three people who read it...would be to register firearms and owners. Further, I'd require gun owners to receive both training and clearance. But we're not calling this gun control. Of course not. This isn't about law enforcement. It would not be viewed or described as licensing of a semi-illicit activity. Instead, it seems more...um...constitutional...to have the registration to be tied in to the D.O.D. Specifically, through the newly formed Homeland Defense Reserve sub-agency of the National Guard. How can our men and women in uniform call on patriotic American gun-owners to stand with them in a time of national crisis if they don't know who they are or how to reach them? So of course you need to register, and have your weapon registered. That data would be shared with DHS and law enforcement, of course. After the lessons we learned on September 11th, you can't have it any other way. With registration and the background checks that insure your preparedness to protect the Homeland would come training. It would have to be renewed every other year, just to keep your skills honed. That mandatory training in firearms use and basic squad tactics, of course, would be conducted through a public/private partnership between the HDR and the National Rifle Association. 'Cause you know, that means some serious new revenue and membership opportunities. This would weed out the crazies and the criminals and those unpatriotic enough to not be willing to prepare themselves to protect America. It would serve the purposes of national defense and law enforcement. And it would...I am convinced...cut down on the shameful slaughter that makes us a global laughingstock. Is it going to happen? Goodness no. No more than the next stage, which would be using such a plan as part of the process of standing down our imperial military to levels more befitting a constitutional republic. But it is, as Shaggy might say, so crazy it just might work. If only we'd try it.